Before you gasp with shock, the above paragraph is even more fictional than the people in Leather’s Cold Kill book published this year (ISBN 0-340-83412-9, Hodder and Stoughton); however, after reading this suspense novel, you too would agree with Kim Fletcher’s take on the situation. Someone had read the book and wanted revenge. Stephen Leather in this latest book reveals a side of undercover policing that most of us have never considered, but when presented with all the horrific details, will shudder. Could this really happen today? In the civilized western society? Surely not. The answer, unfortunately, is a staggering Yes! In fact, author Leather intertwines factual happenings, real places and current events into this thriller. The fact that he appears to do this with impunity does make the reader fear for the safety of the writer. My fictional introduction might just happen. The book opens with a description of a man being systematically tortured to make him divulge information. After that shocking (literally and metaphorically) introduction, you are then swept away to the balmy climes of Phuket to meet some international terrorists. Unfortunately for them, they get swept away as well, victims of the tsunami. The pace does not slow, as by page 25 you are crossing the English Channel in a boat carrying illegal immigrants. By now you are also wondering just what is the tie-in between all these scenarios, but on page 38 you are let into the secret. One of the smugglers is an undercover British policeman, name of Dan Shepherd, and the rest of the book is a chilling chronicle of DC Dan Shepherd’s covert work for the British police agency. 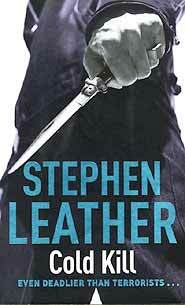 Leather manages to make his characterizations real, by revealing the human side of Shepherd, a widower with a young son who is being deprived of paternal contact, because of the demands of the job, and Shepherd’s subsequent dilemma. For your B. 395, this is the most gripping novel you will read all year. After turning the pages from cover to cover, snarling at any interruptions to your reading in that time, you will turn the last page and exclaim “Those bastards! I knew it. I knew they were like that!” And you will know too why Kim Fletcher was able to identify the (fictional) murderer of Stephen Leather, a most believable (and still living), writer of fiction. Get this book! At the end of 1969 Fairport Convention were to release an album that was to change the face of British rock, and define a whole new genre: folk/rock. The fact that the album was released at all was astonishing in itself. But these days it stands the test of time as a groundbreaking work of genuine originality and bravery. Fairport Convention first took wing into the realms of the British rock scene in 1967. Coming out of the North London folk scene, at first the line-up was kept very flexible, until they released that they might be onto something here. The line-up stabilized to Simon Nicol on guitars and vocals, a great man to have in any band, as adaptability was his middle name, and enthusiasm he kept in bags. Ashley Hutchings took over the bass responsibilities and being steeped in traditional British folk music became the unspoken leader come spokesman for the band. On lead guitar and vocals was one of the nicest men on the planet, Richard Thompson, who also just happened to be one of the most original guitar players of his day, a distinctive vocalist, and a talented songwriter, so all round a pretty useful chap to have on board. Martin Lamble sat behind the skins and was the drummer that every band envied, as not only could he keep time, but he brought with him a style of his own. Judy Dyble was the female singer that fronted the band, who had a fine clear folk voice enabling her to tell the stories the musicians were portraying. But Judy Dyble left the band preferring to stick to her solo folk roots and was replaced by the impeccable Sandy Denny. Now it is beyond any doubt that Sandy Denny was the finest female vocalist ever to come out of modern music. If you have ever heard an angel sing then you have some idea how Sandy Denny sounds. She had a startling career, including appearing on two Led Zeppelin tracks singing with Robert Plant on ‘Battle Of Evermore’ and ‘Going To California’, which rather proves the point as at the time Led Zeppelin could have chosen anybody to sing on their albums. Ian Matthews was then added as a second vocalist and the band went into the studio after signing a contract with the newly formed Island Record Company. After their first album, and dissatisfied with his role in ‘Fairport Convention’, Ian Matthews left after contributing to one track on the next album, understandably as it was very hard for him to compete and be compared to Sandy Denny. Due to their popularity Fairport Convention were almost constantly on the road, and just when everything seemed to be on the up and up disaster struck. In June 1969, returning from a gig in Birmingham, their Van ran off the motorway. In this terrible crash the lives of Martin Lamble and Richard Thomson’s girlfriend Jeannie Taylor were snatched away. Naturally the rest of the members of the band were distraught, and at first could not bear the idea of carrying on without their fallen comrades. But Joe Boyd, Fairport Convention’s manager, rented a remote cottage in Farley Chamberlayne, near Winchester in Hampshire (you can tell how remote it was by the address). The remaining members of the band were invited to live there, and Dave Swarbrick was made a permanent member of the band. A replacement for Martin Lamble had to be found to allow the band to continue recording and touring. Dave Mattacks seemed to have the right temperament, was an excellent drummer, and above all made a superb centre half for the Fairport’s football team. Fairport Convention was a band again. Collectively it was decided that a new direction had to be taken as the others could not imagine playing the old songs without Martin Lamble on drums. The results were stupendous - a landmark in rock ‘n’ roll history. Of the eight tracks, the album opens and closes with originals. Sandy Denny and Ashley Hutchings ‘Come All Ye’ sets the mood perfectly, whilst ‘Crazy Man Michael’ by Dave Swarbrick and Richard Thompson brings the album to a fitting close. In the middle there is Richard Thompson’s beautiful ‘Farewell, Farewell’. In-between are five songs dug out by Sandy Denny and Ashley Hutchings which have been arranged by the band. All of them little gems. The medley in the middle is a joyous collection of tunes, jigs and reels. But perhaps the standout track on the album is ‘Matty Groves’, all eight minutes of it, as it tells of love between the classes. At first Sandy Denny’s beautiful voice leads us through the story, with its sad conclusion before the band breaks in rampaging towards the climax with a fine musical battle between fiddle and lead guitar. ‘Liege and Lief’ (1969) to this day is the British folk rock album. A seminal work which said it all, and launched a thousand imitators. Certainly Fairport Convention’s finest hour. Unfortunately, in their wisdom Island Records have decided to add two further tracks onto the original album, both of which are outtakes never meant for the paying public and do nothing to enhance the album. 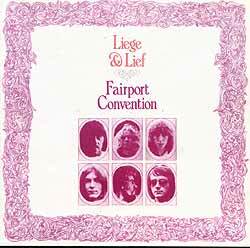 A band under the Fairport Convention banner still records and tours to this day, keeping the Fairport ideals alive. Ashley Hutchings was to reappear in the band’s line-up over the next thirty odd years every now and again when the whim took him, and is always welcomed back with open arms. Sandy Denny re-joined the band in 1975 for another year of touring and one more album, ‘Rising For The Moon’ (1975), but left again in 1976. Sadly she died of a brain haemorrhage on Friday 21st April 1978 after falling down some stairs at a friend’s house the previous Monday; a great loss to the world. But her beautiful voice lives on as can be heard here on this exquisite album.